The drought in the western U.S. is definitely making its impact felt. There are people letting their lawns go, lawn watering being done less often. Reservoirs are at historic lows. The danger of fires is extremely high and aquifers are being drained at exceptionally fast rates. I hesitate to use the term “exponential,” but this may well be the case. This is the new reality. With fires presenting a very real danger, the City of Visalia in California’s south central San Joaquin Valley has decided to cancel its annual July 4th fireworks celebration. The air will definitely benefit and Visalians’ lungs will get some relief. In Visalia making this move, the decision to do so was no doubt a difficult one – bold, even. I’m sure city leaders will have a better idea whether or not it was the correct one after the fact. Does this break with tradition? You know it! A display of antipatriotic sentiment? If you’re even entertaining such a notion, might I inquire as to what planet you’re from? (Disclosure: I’m being facetious in case you can’t tell). As I was saying, how I see the city looking at this is from the standpoint of it being an act of playing it safe, preferring to err on the side of caution, not taking unnecessary risks. I would agree. To me, it just makes sense and even more so if air quality is bad then, as it often is. Looking at air quality records going back several years for July 4th and 5th, consulting the San Joaquin Valley Air Pollution Control District’s Real-time Air Advisory Network (RAAN), data shows for Visalia-Church for the 4th in 2011, particulate matter pollution reached a peak of 129 micrograms per cubic meter of air at 11 p.m. Fine particulates did not return to healthy levels until 2 p.m. the following day. 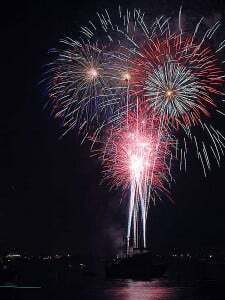 In 2012 on the 4th, particulate levels reached 75 micrograms per cubic meter at 10 p.m. The following year levels reached 88 at 11 p.m. and did not fall into the good range until 10 a.m. the next day. Then in 2014, measurable amounts of fine particulates reached as high as 72 micrograms at 11 p.m., only a slight improvement over 2013. After all is said and done only Visalia can know if cancelling this year’s fireworks festivities was the correct move, however bold it may be. Visalians may look back on this and be grateful. I know people’s pets there will be. Then again, air quality could be negatively impacted if there are many driving outside city limits to attend fireworks displays elsewhere. In SJV seeking clean air has it been one step forward, two steps back?